First and foremost… what an unmitigated mess they’re making of the leadership contest… the LP elite have certainly shown us their ‘petticoats’. Significantly, the proverbial tide has gone out, revealing their implicit attitudes and assumptions … and amazingly, we’ve seen New Labour hoist by its own petard. How has New Labour been hoisted? Through their machinations, they’ve achieved their own worst outcome. So, if Jeremy Corbyn wins in spite of the ‘purge’, his victory will be legitimated. But the reverse is true, if Andy Burnham or Yvette Cooper win. So if Jeremy fails to get a majority and loses, there will be an exodus of voters, members and trades unionists disgusted at the behaviour of the Right (as well as the snooping on social media, asking local branch secretaries to use canvas returns to vet local supporters etc.). Why is it that a Tory MP can cross the floor of the House of Commons and be welcomed with open arms but an ex-Labour Party member is suspect for wanting to return to Labour? The crux question is whose ‘Aims and Values’ are being judged as Labour’s … or is the whole thing a charade – just a proxy for shoring up the current LP hierarchy? Given the hysterical reaction of the New Labour Right to the voting system, was it ‘all Ed’s fault’? In order to counter accusations from the press (fuelled by both the Tories and the Blairites) that he was under the spell of the trade unions (and Unite in particular), Ed Miliband called a special conference to agree changes to the rules. Under pressure from Progress, Miliband also opened up the vote for the party leadership to non-members (an open primary) and required union members to sign up to pledge their allegiance to the party before being given the right to vote. Ed Miliband’s decision to turn the page on New Labour was seen by many party figures and media pundits as a heresy that had to be fought. That fight started on Miliband’s first day on the job and only ended when he resigned. In the early days of his leadership, many angry Labour voices claimed that Miliband’s victory was not legitimate because he did not win the vote of the majority of the parliamentary party…. other criticisms started to be heard. Miliband was too left-wing, too wonky, too weird and his policies lacked credibility. The Blairite wing – inside but also outside the House of Commons – was particularly disruptive and did everything to undermine his authority. Lord Mandelson was a case in point. He never wasted an opportunity to say that Miliband was wrong to deviate an inch from the New Labour rulebook. And when Lord Mandelson or the former Prime Minister Tony Blair were too busy with their daytime jobs to attack the Labour leader there were plenty of backbenchers and, occasionally, frontbenchers who fed stories to the media about how Miliband’s leadership was hanging by a thread… the aim of these attacks was to destabilise Miliband. …Miliband also faced a hostile media.…Party divisions, plots, constant media attacks paralysed the party, in particular its policy development process. When the electoral manifesto was finally approved last spring the proposals that came out were confusing, unconvincing and uninspiring as Miliband tried to cater to all factions and ended up pleasing none. Tony Blair has said he would not want a left-wing Labour party to win a general election. I agree with him. Harriet Harman’s decision to abstain on Osborne’s Welfare Bill was the final straw but it was the prospect of a Labour leader who was even further to the right than Ed Miliband that was totally unacceptable to many in the grassroots of the LP. Ed Miliband may have been the loser in the 2015 General Election but instead been the midwife to the re-birth of ‘real’ Labour. Furthermore, the ways in which Ed Miliband was constantly undermined by the Right, throughout his leadership, should forewarn those of us who support Jeremy Corbyn for the leadership. Should he be elected, we must act to prevent similar abuse of the membership’s democratic decision. The fight to reclaim the Labour Party will not end on the 12th of September whatever the result. 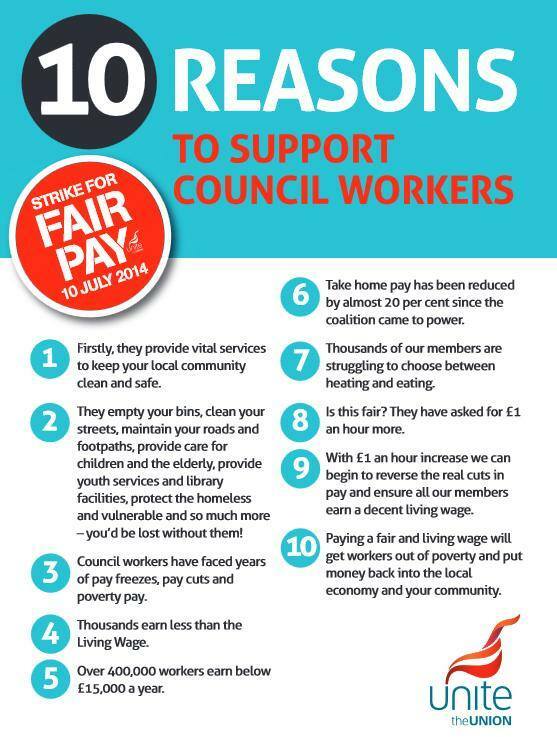 Council Workers have reason to be angry (they’re certainly not sad) Support the Strike. Unite the union activists showing how happy they are to be part of, and supported by, the best union in the UK – Unite! Labour Assembly Against Austerity – a forum for Labour Party members to discuss alternatives to austerity and the policies Labour needs to stimulate growth, jobs and rising living standards. The Labour Assembly Against Austerity is an initiative of Next Generation Labour in support of the People’s Assembly Against Austerity movement and is supported by Unite, UCATT, BECTU, CLPD, Labour Representation Committee, Left Futures, Chartist, Labour Briefing Co-op, Morning Star, Red Labour & Sinistra Ecologia e Liberta UK.